At its heart, pizza is just cheese, dough, and tomato sauce, topped with whatever additional ingredient you want. Inherently, pizza exists to breed creativity and adaptivity. In the hands of madmen and foreigners, this culinary freedom can be disastrous, but in the hands of true Americans, this can create an unhealthy, delicious American meal glorious enough to single-handedly keep additional-belt-hole-punchers in business. 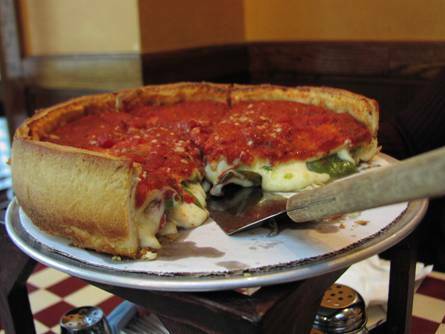 One of the most glorious examples of this, of course, is the Chicago-style pizza. 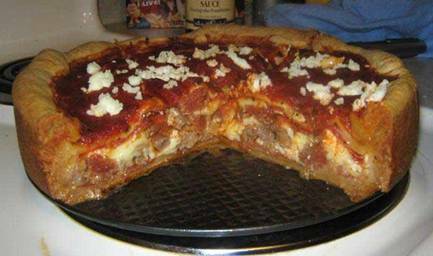 Less of a pizza pie, and more of a pizza cake, Chicago’s deep dish pizza gives you as much fat, grease, and cheese as you’d expect to find from a city that’s primary gift to the realm of fine cooking involves hot dogs and roast beef dipped in its own juices.